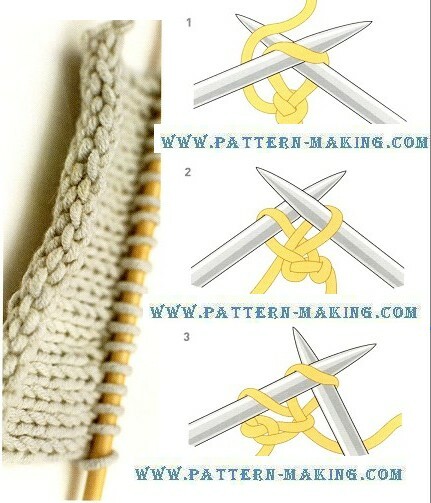 This cast -on method gives a looser edge than the thumb cast-on, although it can he tightened to create a firmer, more elastic edge by knitting into the back, of the stitches on the next row. 1. Make a starting loop on the needle as already described and hold this needle in your left hand. Hold the ball end of the yarn and the other needle III your right hand. Insert the right needle through the loop as shown and pass the yarn around the tip. 2. With the tip of The right needle, pull the yarn through the loop on the left needle to create a new loop on the right needle. 3 Transfer this new loop onto the left needle, by inserting the lip of the left needle from right to left through the front of the loop. Withdraw the right needle, then reinsert it through the loop just made, as shown, to start the next cast-on stitch. Repeat steps 1 through 3 to cast on as many stitches as you need. 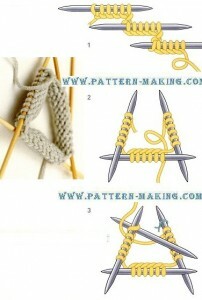 When you want to knit a tube, without a seam, you use four needles rather than two. When you knit, you simply work clockwise around three needles. using the fourth as the working needle. First, of course, you have to cast on stitches onto three of the four needles, a chain-edge cast-on is recommended. 1 Using the chain-edge cast-on, cast on the stitches onto one needle, then divide them evenly between the three needles. 2 To start to knit. arrange the three needles In a triangle. The working yarn Will be at the end of the third needle. 3 Loosely knot a colored thread around the needle next to the working yarn to mark the start of the rounds. Then start to knit with the fourth needle, closing the cast-on triangle when knitting through the first stitch on the first needle.